DOLLE Copenhagen - Modular staircase in solid hevea with lacquer finish. Very flexible and adjustable to any room as the center of the staircase is rotatable. The safety is in top with the stylish handrail in solid hevea and steel wire balustrades. 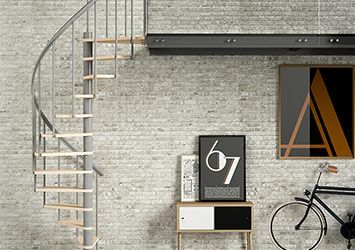 The DOLLE Copenhagen staircase is a Scandinavian design kit staircase and comes with 12 treads. That work for an adjustable room height up to 292 cm. The staircase has an outside width of only 64 cm, which makes the staircase fantastic for small rooms. Why not make more space in your house and make use of the attic room – make yourselves a walk-up closet or a paint studio with this type kit stair which, does not take up much room at ground floor. The distance between the treads is flexible between 18.5 to 22 cm, making the staircase modular to fit any room. The steel is grey painted metal with steps and handrail in solid painted hevea and handrail with wire steel. The space saving staircase DOLLE Copenhagen comply with UK building regulations for secondary or loft ladder applications.